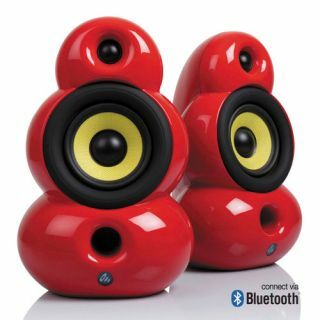 Scandyna 'Pod' speakers get Bluetooth wireless streaming | What Hi-Fi? Scandyna's iconic SmallPod and MiniPod speakers are now available with built-in apt-X Bluetooth for wireless music streaming from PCs, laptops, smartphones and tablets. The SmallPods cost £599 a pair, the MiniPods £299. Both versions are available now in gloss red, white or black. Power output on the SmallPod is 2 x 40W, while the MiniPods deliver 2 x 20W. Both come with a mini remote control, an analogue 3.5mm input and spiked feet. Wall brackets are optional.